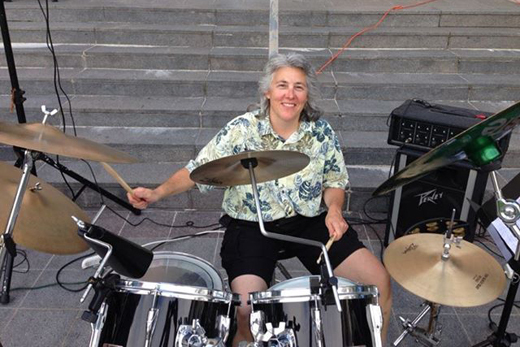 Karen Newell, academic coordinator for Emory's Physician Assistant Program, has been playing and teaching drum/percussion for more than 40 years. Courtesy photo. As academic coordinator for the Emory School of Medicine's Physician Assistant Program, Karen Newell has often taken the stage of the Woodruff Health Sciences Center Administration Building (WHSCAB) Auditorium. As a student, she walked across that stage in 1989 to collect her diploma from Emory's Physician Assistant (PA) Program. And as a faculty member, she's watched more than 1,000 students march across it during their graduation exercises, too. She's also lectured there and even helped administer board exams in the space. The one thing she's never had the chance to do there? This weekend, she'll remedy that, as Newell — who has been playing and teaching drum/percussion for more than 40 years — takes to the WHSCAB stage to host "Celebrating the Drum: A Tour of the World," an eclectic event that blends innovative drum and percussive performance with fundraising advocacy, on Saturday, May 17, from 4 to 6 p.m. The performance will benefit the Emory School of Medicine PA Program's South Georgia Migrant Farm Worker Health Project, which brings free healthcare clinics to more than 1,000 farmworkers and their families each summer. For Newell, it's a serendipitous opportunity to unite two great passions: music and health advocacy — not surprising for a woman who pursued a medical career on music scholarships. This marks the 20th year that Newell has hosted public percussion recitals showcasing the talents of her private music students; in recent years, she's also used the event as a migrant health project fundraiser. This is also the first time the recital will be held on the Emory campus. Before show time, Emory Report caught up with Newell to talk about how her love of music and percussion fits with a career built upon teaching and medicine. How did music emerge as such an important influence in your life? Growing up in Golden, Colorado, I started drumming with Magic Markers on the seat of a vinyl chair in our playroom — my song was the theme from "Hawaii Five-0." I was supposed to be in bed, but I would beg to be allowed to stay up late enough to hear that opening song, which was by The Ventures. I must have been 5 or 6. When I was a little older, I traded a huge hunk of clay with a neighbor for a pair of his older brother's drumsticks. I still have those sticks. Was sticking with percussion an obvious choice? In 4th grade, you could play in the school band, but back then, girls didn't even try the drums. My parents allowed me to try out, thinking it might not last. I really liked it a lot, ended up getting a snare drum and private lessons. I was actually gigging when I was 13 years old, playing in the Western bars on Colfax Avenue. I played for all the Sons of Italy, the Knights of Columbus and other popular lodge events, and every conceivable musical opportunity. In high school, I knew I was interested in medicine, and Colorado State University gave me a music scholarship and said I didn't have to be a music major. So I was a double major— biology and zoology — and a double minor — anatomy and music. I also did drum and bugle corps. So when I came to Emory to start the PA program, I auditioned and was asked to join "the Band of Braves" and played for all of the home games for the Atlanta Braves. We would only play for these 30 second breaks, never complete a song. But I knew I could sit there and study. My roommate would ask me who'd won and I'd never know! So everywhere I went, I played. As your medical career advanced, how did you fit both interests together? After Emory, I went to Yale for a post-graduate PA surgical residency program and played in both the Yale Marching Band and the Norwalk Symphony. After Yale, I went back to Colorado to practice cardiothoracic surgery. But I was on call 24/7 and couldn't commit to playing music the way I wanted. I'd loved doing my rotations in the Emergency Room at Grady (Memorial Hospital); soon, I'd moved back to Grady to get my medical fix. The good thing about the ER is you have set hours. So when I moved back here, I could do everything. I played with a lot of different groups, teaching private lessons, teaching drum lines for high schools. I always took students. This is your 20th year as a music educator — what keeps you in that role? I really love teaching — that, and I do a lot of really way-out things, like I make my own instruments. I'm famous for going to Home Depot and finding things and making things. I've played a lot on Home Depot paint buckets. Sometimes when they see me coming, they get that look in their eyes like, "Quick, call security!" What distinguishes the recital this year? The whole point this year will be to celebrate drumming around the world. It's not just my music students; we'll have someone from India playing the tabla, I'll have a group of my students do a taiko drum piece on buckets to represent Japan. I will be playing the dunun (West African drums) along with djembe accompaniment, and for my private lesson students, all the beats will be Latin. I also opened it up to a few of my PA students, to see if they wanted to participate. So we'll have one student singing and playing the guitar. For last year's recital, the theme was "Blue Man Group meets Stomp" — it was so popular that it's our finale again this year. Why the drums? What hold do they have over you? I find it fascinating that throughout all these countries, the drum is always there, kind of like a heartbeat. It's also a way for all my worlds to come together. I feel like I'm a soccer ball and have all of these facets. This is where my worlds all come together, at this function. Everyone who knows one tiny facet of my life gets a glimpse of an entirely different thing. How do readers find out more about the event or how they can help? Although the recital is free, there are opportunities to help out … We're asking for monetary donations, and also food and hygiene kit supplies: toothbrushes and travel-sized toothpaste, deodorant, shaving cream and sunscreen, as well as razors, bars of soap, and clean white athletic socks. We can also use food, such as rice, dried beans and canned tuna. For more information, or to see videos from past performances, people can check out http://knewelldrums2013.yolasite.com/ and http://knewelldrums2014.yolasite.com/.